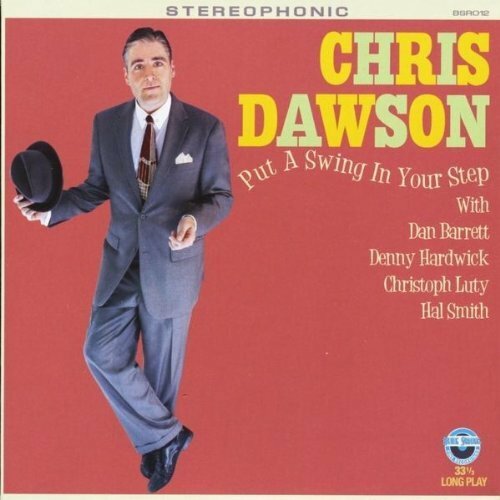 Chris Dawson hasn’t received the attention his playing deserves, but his latest CD (for Blue Swing Fine Recordings) will fix that. It’s superb. People who admire these musicians as I do won’t need any more prompting. They can buy copies (note the plural) of the disc at www.blueswing.com., www.CDBaby.com., or email Chris personally at chrismartindawson@yahoo.com to purchase personally inscribed copies. When a European jazz researcher asked Eddie Durham what he thought of Edmond Hall, Durham said it all in one sentence, “Edmond Hall didn’t know how not to swing!” Those words popped into my head as soon as this disc began to play, because for Chris and his friends inspired jazz improvisation is second nature. Mind you, I don’t pretend to have cool objectivity. I first heard Chris as part of the ensemble on a handful of sessions about twenty years ago (with Rebecca Kilgore, Marty Grosz, and Hal Smith) and he leaped out from the speakers although he wasn’t playing any louder than anyone else. It was the absolute rightness of what he played: time, feeling, harmonic subtlety – an art that didn’t call attention to itself and thus was instantly compelling. Although I heard echoes of Nat Cole, Hank Jones, and Mel Powell, Chris was complete in himself, and his playing was more than a collection of memorized gestures. It might seem melodramatic for me to write that I spent the next two decades waiting for this CD, but it it’s the truth. I was delighted to hear Chris’s solo Christmas CD in 2009, and thrilled to see clips from these sessions appearing on YouTube. Now, the evidence is here to share and treasure! I doubt that these five players immersed themselves in Golden Era science fiction, but it would explain a great deal, for they are time-travelers who don’t need gleaming machines. Chris and his gang have reached the kind of musical flexibility and maturity where all swinging jazz is equal and equally worth cherishing: James P. Johnson and Bud Powell live in the same building and chat happily in the elevator. Listen to PUTTIN’ ON THE RITZ, where Chris melds the earthy yet delicate swing I’d associate with a 1938 Vocalion with the harmonic inventiveness and sense of space that characterized “Mainstream” several decades later. It isn’t artificial: I never feel that he is thinking, “Now I’ll throw in an Augmented Nineteenth chord in the right hand (from Hindemith) over my Official Stride Pattern (Don Lambert) in the left”; it’s genuine and internal, in the manner of such stylistic investigators as Ruby Braff and Dave McKenna. And although music has the power to make us reflect deeply on the great sadnesses we all face, this session is resoundingly happy – it echoes the reassuring pace of the steady heartbeat. Even the lovely ballads on this disc aren’t hopelessly gloomy: while their sounds chronicle shattered dreams (as on OH, YOU CRAZY MOON), we admire the beautiful sounds. Although Chris doesn’t dramatically demand the spotlight, I find myself listening to a performance over and over, savoring at how Chris’s left hand knows what his right hand is doing, and vice versa. And he’s my model of an ensemble pianist – how does he pick just the right notes? Hear him support, cheer, and encourage everyone throughout this disc! Chris is not only a satisfying small-group arranger but a splendidly masterful pianist. Admire his unerring gently propulsive pulse; his steady time; the ringing sound he gets out of the instrument; his chord voicings. And what delights he can create in a small space: his four-bar introductions are gems. MY IDEAL is a graduate course (for those who can hear) in how to make melody come alive, how to convey tenderness while keeping the rhythm going. And his HANDFUL OF KEYS honors Fats – in ways both accurate and jubilant – adding his own touches to this great display of playful athleticism. Pleasures untold greet those who listen! Chris is an original, not a copyist. He isn’t a museum piece but a creative improviser . . . ! And what he does is irreplaceable.